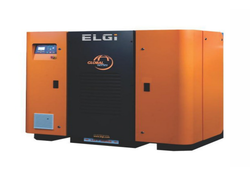 Prominent & Leading Manufacturer from Coimbatore, we offer eg series screw air compressors 50 hz, eg series screw compressor, eg series screw compressors, eg series screw compressors eg 160p, eg series screw compressors eg 90 and elgi eg screw compressor. ELGi has modern manufacturing facilities equipped with advanced high precision grinding machines, turning centres and CNC horizontal and vertical machining centres. Screw airends are manufactured with the latest rotor grinding technology, coupled with measurement technology to maintain precise manufacturing tolerances. ELGi's manufacturing plants are both ISO and EOHS certified. The products are manufactured under controlled environment to ensure that its quality continues to meet the highest standards. 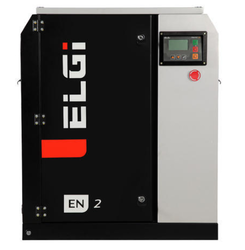 We are offering a wide range of EG Series Screw Compressor which is a type of gas compressor that uses a rotary-type positive-displacement mechanism. They are commonly used to replace piston compressors where large volumes of high-pressure air are needed, either for large industrial applications or to operate high-power air tools. This product is a continuous sweeping motion, so there is very little pulsation or surging of flow, as occurs with piston compressors. The high volume of air, steady flow. 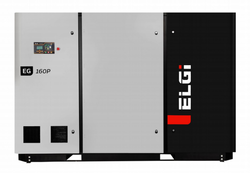 90 to 160 kW Screw Compressors represent a giant leap in design and performance with each component designed for reliability and ease of maintenance. The compressor is manufactured in compliance with applicable international standards (CE , ASME, UL and others) and designed as per the international quality standards. These new generation compressors significantly reduce operating costs and provide cost savings with fast return on investment. 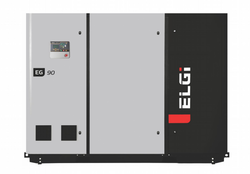 The EG Series compressors, represent a glant leap in Design and periormance with each component design for reliability and ease of maintenance. the compressor is manufactured in compliance with appliable international standards (UL, ASME, CE and others) and designed as per the international quality standards. These new generation compressors significantly reduce operating cost and provide costs savings with fast return an investment. 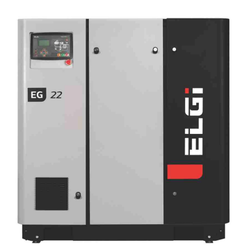 EG Series Compressors provide high-quality compressed air in the harshest environmental conditions. Incorporating the nest generation technology of ELGi's oil-injected screw element provides a long and trouble-free life at the lowest possible operating cost. 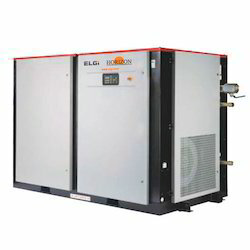 These compressors are designed, manufactured and tested in accordance with ISO 1217, which comes with an in-built Variable frequency drive that significantly reduces energy consumption and cost. 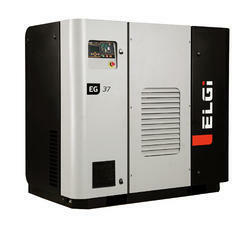 ELGI EG Screw Compressor, the ideal choice for all kind of industry and applications. Every screw compressor model is equipped with an exclusive screw block, constructed with the strongest materials and each compressor ensure exceptional performance, efficiency, and long-lasting maintenance life. We are one of the prevailing organizations for providing Encapsulated EN Air Compressor in the market. These compressors are developed using advanced technology and a quality component which further increase the strength and durability. These machines are commonly used to supply compressed air to various industrial applications. Besides, our clients can receive these compressors at a market affordable price. We are one of the prevailing organizations for providing Encapsulated EN Air Compressor in the market. These compressors are developed using advanced technology and quality component which further increase the strength and durability. These machines are commonly used to supply compressed air to various industrial applications. 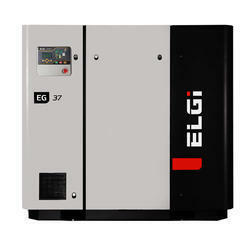 Besides, our clients can receive these compressors at market affordable price. We are a remarkable entity, engaged in offering a superior quality assortment of Screw Air Compressor. It is used where large volumes of high-pressure air are needed and are demanded in various industries. The offered compressor is manufactured in compliance with international industry standards using well-tested raw material under the vigilance of our professionals. With a view to satisfying the requirements of the clients, a provided compressor is made available in different specifications. Our clients can avail this Rotary Compressor from us at industry-leading prices. Being a quality oriented organization, our company provides standard quality range of Single Stage Horizon Screw Compressor. This Horizon Series Screw Compressor is available in different models and range as per the client’s requirements. Furthermore, our product range is checked for quality under various set norms of the industry. We offer Single Stage Screw Compressor to our clients. 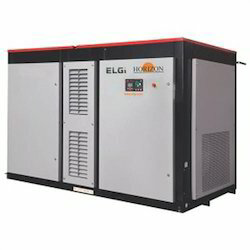 11 to 75 kW Two Stage Horizon Screw Compressor represents a giant leap in design and performance with each component designed for reliability and ease of maintenance. We offer Two Stage Screw Compressor to our clients.